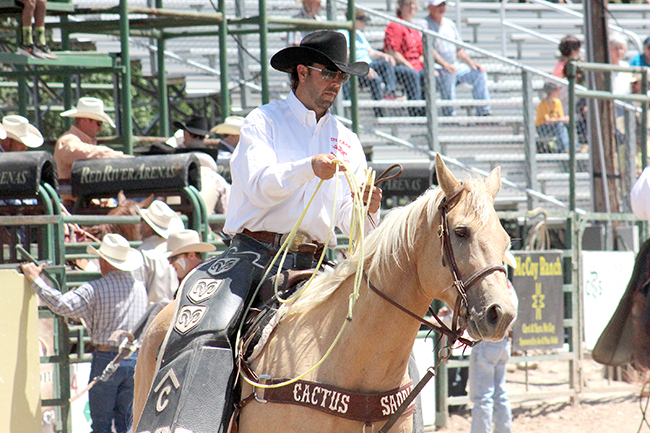 Pickup man Josh Edwards has been a fixture at Dodge City Roundup Rodeo. He returns to work all six nights of this year’s event, from the A Whole Lotta Bull on Tuesday, Aug. 2, to the five nights of world-class rodeo action that follow. DODGE CITY, Kan. – Josh Edwards has movie star looks and a Hollywood swagger. That’s served him well in his multifaceted career. Not only is Edwards considered one of best pickup men in ProRodeo, he also is a stuntman who owns his Screen Actors Guild card. Most of the time, Edwards serves as a bucking-horse wrangler and all-around cowboy inside rodeo arenas all across the country. In fact, he will be one of the men on horseback throughout every performance of the Dodge City Roundup Rodeo, set for 7:45 p.m. Tuesday, Aug. 2-Sunday, Aug. 7, at Roundup Arena. “This would be my sixth year working in Dodge City,” said Edwards, an athletic Texan that enjoys his many roles life has to offer. “I’m very fortunate to have more than a couple of very prestigious rodeos that I get to be part of, and Dodge City is one of them. I love going there for many reasons, not just the prestige and nature of the event. One thing cowboys love about Roundup Rodeo is the hometown feel. Rodeo cowboys – even those that work on site for the week of the event – are nomads who travel the rodeo trail to make a living. Edwards lives much of his year in an elaborate horse trailer that has been outfitted with living quarters. He makes Roundup Arena his home for a week, then moves on to the next rodeo. That’s why having the comforts of home is so important to him. “In my personal opinion, it’s not the rodeo that’s special in Dodge City,” he said. “When you do it every week, the rodeos are the same. It’s the same contestants, the same stock. Rodeo is full of history, from cowboys “taming” the Old West and playing around on days off to the creation of community celebrations nationwide. For more than a century, cowboys have made their way to historic venues. Edwards is no different. “There is a lot of history to a lot of the rodeos I’ve gone to, like Dodge City, Houston, San Antonio, Fort Worth (Texas), Cheyenne (Wyo. ),” Edwards said. “I’ve been to many of the biggest rodeos, but really it goes back to the people and the relationships you create at those events. Josh Edwards has helped Hollywood tell several stories. Maybe one needs to be done on him, co-starring Roundup Rodeo.